Urinary tract infections (UTIs) are common clinical episodes during pregnancy, and uropathogens such as pathogenic E. coli accounts for a significant cause of UTI. Though antimicrobial resistance is an essential survival strategy of microorganisms, this natural phenomenon is also a public health challenge for all humanity. This is because of the growing cases of antimicrobial resistant bacteria from both the community and hospital environment that defy the antimicrobial onslaughts of some available antibiotics. It is therefore vital to update on the antibiogram of uropathogens from urine samples of pregnant women in order to guide therapy. In this study, the clean-catch mid-stream urine (MSU) samples from pregnant women in a private hospital were bacteriologically analyzed for the isolation, characterization and antibiogram of uropathogenic E. coli. Antimicrobial susceptibility studies were carried out using the modified Kirby-Bauer disk diffusion method as per the Clinical Laboratory Standard Institute (CLSI) guidelines. A total of 41 (34.2%) E. coli was isolated from the urine samples analyzed in this study. The isolated E. coli was resistant to amoxicillin, sulphamethoxazole-trimethoprim, ceftazidime, amoxicillin-clavulanic acid, ceftriaxone, ofloxacin, nitrofurantoin, aztreonam and nalidixic acid; and they were found to be multiply resistant to the tested antibiotics. Conclusively, the proper and timely detection of drug resistant bacteria from urine samples of pregnant women is necessary to guide therapy and also to prevent the emergence and spread of drug resistant bacteria in the hospital environment. Microbial resistance to antibiotics can never be overemphasized and it increases in a geometric pattern owing to the misuse of antibiotics in the hospital and non-hospital environment. Many clinical, social and environmental factors have been proposed to aid in the wide spread of multidrug resistant microbes. These factors include inconsistency to treatment, availability of overthe- counter (OTC) drugs with reduced potency, wrong laboratory diagnosis, abuse of broad spectrum antibiotics and the use of antibiotics in livestock and poultry production [1,2]. Pathogenic Escherichia coli is a member of the Enterobacteriaceae family, and it is one organism with a well-documented history of resistance to antimicrobial agents [3,4]. Pathogenic E. coli are able to cause a wide range of human disease and infection such as urinary tract infections (UTIs), diarrheal disease, meningitis and sepsis [5-7]. E. coli is the most common etiological agent in UTI from uncomplicated urinary tract infection . Antimicrobial resistance is a well-known clinical and public health problem . Over the last three decades, pathogenic bacteria have evolved toward antimicrobial drug resistance . The widespread use of broad-spectrum antibiotics has led to the emergence of nosocomial infections caused by drug resistant microbes . Bacterial antimicrobial drug resistance is a worldwide problem that has been exacerbated by the diminishing number of new antimicrobial drugs in the pharmaceutical pipeline . Pathogenic E. coli is commonly found in the gastrointestinal tract (GIT) of humans and animals as normal flora. But in ascending infections, feacal bacteria colonize the urethra and spread up to the urinary tract and finally to the urinary bladder. Since women have a shorter urethra compared with that of men, they have a higher chance of getting a UTI than men . UTI is a common infection in pregnant women and urine samples are usually required from them to evaluate the menace. Most uncomplicated UTIs are caused by pathogenic E. coli, which frequently colonizes the periurethral tissues. Pregnancy markedly predisposes to pyelonephritis, and bacteriuria during pregnancy is associated with prematurity and low birth weight. Urine culture should be obtained at the first prenatal visit; and pregnant women with asymptomatic bacteriuria should be treated with a 3-day course of antibiotics [12,13]. However, uropathogens including pathogenic E. coli are becoming increasingly resistant to most commonly available antibiotics. There is therefore need to update on the antibiogram of pathogenic E. coli from urine samples of pregnant women in order to guide therapy and prevent the emergence and spread of resistant bacteria. Clean-catch mid-stream urine (MSU) samples was collected from 120 pregnant outpatients (with informed consent) attending a private hospital in Abakailiki, Nigeria using sterile universal containers. Each of the collected urine samples was properly labelled and stored in an ice packed flask, and transported to the Microbiology Laboratory unit of Ebonyi State University, Abakaliki for bacteriological analysis. The urine samples were aseptically inoculated on MacConkey agar, cysteine lactose electrolyte deficient (CLED) medium, and eosin methylene blue (EMB) agar plates and incubated at 37°C for 18-24 hrs. Suspected and significant bacterial colonies was sub-cultured onto freshly prepared plates of MacConkey agar, CLED, and EMB agar plates for the isolation of pure cultures of the E. coli. All isolated E. coli isolates was identified based on standard microbiological techniques . AST was carried out using the Kirby-Bauer disk diffusion technique as was described previously using single antibiotic disks comprising sulphamethoxazole-trimethoprim (SXT, 25 μg), amikacin (AK, 30 μg), ceftazidime (CAZ, 30 μg), nalixidic acid (NA, 3 μg), cefotaxime (CTX, 30 μg), ertapenem (ETP, 10 μg), ofloxacin (OFX, 5 μg), amoxicillin (AML, 10 μg), amoxicillin-clavulanic acid (30 μg), aztreonam (AZT, 30 μg), ceftriaxone (CRO, 30 μg) and nitrofurantoin (F, 300 μg) (Oxoid, UK). The inhibition zone diameters (IZDs) were measured, interpreted and recorded as per the guidelines of the Clinical Laboratory Standard Institute [14,15]. MARI was determined to decipher the multiple resistance of the pathogenic E. coli isolates as was previously described . The isolation rate of pathogenic E. coli in this study is shown in Table 1. Out of the 120 mid-stream urine (MSU) samples bacteriologically analyzed in this study, a total of 41 (34.2%) Escherichia coli were isolated from the urine samples. Table 2 shows the percentage distribution of E. coli isolated from pregnant women according to age. According to age, more urine samples were collected from pregnant women at age 30 yrs (29.2%). The least number of samples was collected from pregnant women between the ages of 27-29 yrs (14.6%). However, a total of 35 urine samples and 28 urine samples were collected from pregnant women between the ages of 18- 23 yrs and 24-26 yrs respectively (Table 2). Figure 1 shows the percentage resistance of the isolated pathogenic E. coli to some commonly used antibiotics (Tables 1 and 2). 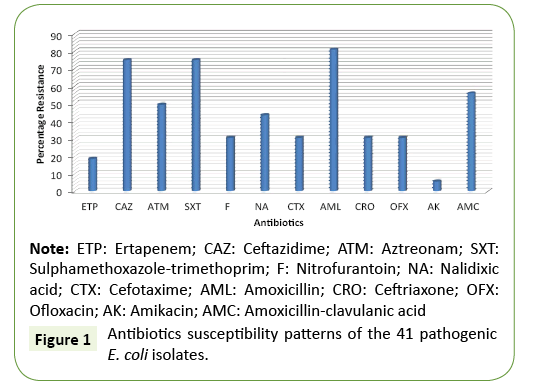 Figure 1: Antibiotics susceptibility patterns of the 41 pathogenic E. coli isolates. Table 1 P revalence of pathogenic E. coli. Table 2 Percentage distribution of E. coli isolated from pregnant women according to age. The antimicrobial susceptibility pattern of the isolated pathogenic E. coli shows that the E. coli isolates produced varied levels of resistance to the tested antibiotics. The isolated E. coli was highly resistant to amoxicillin, sulphamethoxazole-trimethoprim, ceftazidime, amoxicillin-clavulanic acid, ceftriaxone, ofloxacin, nitrofurantoin, aztreonam and nalidixic acid (Figure 1). The multiple antibiotic resistance index (MARI) of some selected pathogenic E. coli in this study is shown in Table 3. The multiple antibiotic resistance index of the isolated pathogenic E. coli in this study ranged between 0.4 – 0.9. On average, the MARI result shows that the isolated pathogenic E. coli was resistant to about 9 antibiotics out of the 12 antibiotics used in this study, and this shows the multiple antibiotic resistance nature of the isolated organism (Figure 1 and Table 3). Table 3 Multiple antibiotic resistance index (MARI) of the E. coliisolates. Urinary tract infections (UTIs) such as bacteriuria, vaginitis, cystitis and pyelonephritis are frequently encountered medical complications of that are characteristics of pregnancy. And UTI during pregnancy is usually common and experienced by pregnant women due to physiological changes that occur during pregnancy, and which cause their immune system to be susceptible to bacterial infections. Antibiotic resistant microbes pose serious threats to both mother and fetus as treatment becomes more difficult with safe antibiotics. The development of anti-microbial resistance in many bacterial species constitutes one of the most serious problems in the control of infectious disease. This study was aimed at evaluating the antimicrobial susceptibility and multidrug resistance of E. coli isolates recovered from urine samples of pregnant women attending a private hospital in Abakaliki, Nigeria. A total of 41 (34.2%) isolates of Escherichia coli were isolated from the urine samples bacteriologically analyzed in this study. The E. coli isolates isolated from the urine samples of the pregnant women in this study was more prevalent in pregnant women at the age range of 18-23 and 24-26 years old. Maternal age may be a significant risk factor in the occurrence of UTI due to Enterobacteriaceae infection during pregnancy. The rate at which most antibiotics are losing the battle against resistant organisms should be of immense concern to the health professionals and calls for effective measures to promote rational use of antibiotics and thereby prolong life expectancy (Anyaodoh-Nwadike, 2015). In this study, we observed that the isolated E. coli was resistant to some of the commonly used antibiotics for treatment of UTI during pregnancy. The E. coli isolates was most resistant to sulphamethoxazole-trimethoprim, ceftazidime, amoxicillin-clavulanic acid, ceftriaxone, ofloxacin, nitrofurantoin, aztreonam and nalidixic acid. Based on their multiple antibiotic resistance index (MARI), the E. coli isolates had a MARI that ranged from 0.4 – 0.9, and this implies that the E. coli isolates was resistant to more than 50% of the total antibiotics used. E. coli from samples of pregnant women are resistant to ciprofloxacin, nalidixic acid and perfloxacin as observed in this study. In this study, the isolated E. coli was found to be resistant to nitrofurantoin, a commonly used drug for treatment of UTI. Conclusively, this study has presumptively shown that pathogenic E. coli from urine samples of pregnant women are multidrug resistant in nature, and thus they are resistant to some commonly used antibiotics for UTI treatment. The proper and timely detection of drug resistant bacteria from samples of pregnant women in hospitals will help to guide therapy and prevent the emergence and spread of antibiotic resistant bacteria in both the hospital and non-hospital environment. Ndugulile F, Jureen R, Harthug S, Urassa W, Nina L (2005) Extended spectrum β-Lactamases among gram-negative bacteria of nosocomial origin from an Intensive Care Unit of a tertiary health facility in Tanzania. BMC Infectious Diseases 1471:2334-2335. Ejikeugwu C, Duru C, Iroha I, Oguejiofor B, Okoro L, et al. (2017) Detection of Escherichia coli strains producing AmpC enzymes using Ceftazidime-Imipenem Antagonism Test (CIAT). International Journal of Research Studies in Biosciences 5:41-45. Messai Y, Benhassine T, Naim M, Paul G, Bakour R (2006) Prevalence of β-lactams resistance among Escherichia coli clinical isolates from a hospital in Algiers. Rev Esp Quimioterap 19:144-151. Nkang AO, Okonko IO, Mejeha OK, Adewale OG, Udeze AO, et al. (2009) Assessment of antibiotics susceptibility profiles of some selected clinical isolates from laboratories in Nigeria. Journal of Microbiology and Antimicrobials 1:019-026. Madigan MT, Martinko JM, Dunlap PV, Clark DP (2009) Brock Biology of microorganisms (12th edn.). Pearson Benjamin Cummings Publishers, USA. pp: 795-796. Talbot GH, Bradly IE, Edwards Jr, Gilbert M, Scheld B (2006) Bed bugs need drugs: An update on the development pipline from the Antimicrobial Availability Task Force of the Infectious Diseases Society of America. Clin Infect Dis 42:657-668.
Cooper KK, Mandrell RE, Louie JW, Korlach J, Clark TA (2014) Comparative genomics of enterohemorrhagic Escherichia coli O145:H28 demonstrates a common evolutionary lineage; Escherichia coli. Genomics15:17. Oteo J, Campos I, Baquero F (2002) Antibiotic resistance in 1962 invasive isolates of Escherichia coli in 27 Spanish hospitals participating in the European Antimicrobial Resistance. Scientific Journal of Microbiology 1:19-26. Courvalin P (2005) Antimicrobial drug resistance: Prediction is difficult, especially about the future. Emerg Infect Dis11:1503-1506. Chikere CB, Chikere BO, Omoni VT (2008) Antibiogram of clinical isolates from a hospital in Nigeria, African Journal. Biotechnology7:4359-4363. Gilad J, Brer A, Shlaeffer P, Shlaeffer F, Resenberg K, et al. (2000) Acquired urinary tract infection (UTI) in Southern Israel: Things are getting worse. Abstract Inter-scientific Conference. Antimicrobial Agents Chemotherapy 40: 17-20. Dielubanza EJ, Schaeffer AJ (2011) Urinary tract infections in women. Med Clin North Am95: 27-41. Cheesbrough M (2006) District Laboratory Practice in Tropical Countries (2nd edn.). Cambridge University Press, UK. p.187. Clinical Laboratory Standard Institute (2005) Performance standards for antimicrobial susceptibility testing; Fifteenth Informational Supplement. CLSI document M100-SI5. CLSI, Wayne, PA.
Iroha I, Nwakaeze E, Ejikeugwu C, Oji A, Udu-Ibiam E, et al. (2013) Frequency and antibiogram of uropathogens isolated from urine samples of HIV infected patients on antiretroviral therapy. American Journal of Bio Science1:50-53. Akinjogunla OJ, Enabulele IO (2010) Virulence factors, plasmid profiling and curing analysis of multidrug resistant Staphylococcus aureus and coagulase negative Staphylococcus spp. isolated from patients with Acute Otitis Media. Journal of American Science 6:1022-1033.